The balcony remains have undergone ‘destructive testing’ to discover the source of its structural damage. THE REMAINS OF the fourth floor balcony involved in the Berkeley disaster that killed five Irish students in June have undergone specific tests in order to establish what caused the tragedy. The balcony’s remains, together with beams from an adjacent third floor balcony, have been put through ‘destructive testing’ alongside each other at a secure location in order to establish the source of the water damage which lead to the structure’s collapse on 16 June. “The Alameda District Attorney’s Office has moved forward with a significant part of its investigation,” Kevin Dunleavy, Assistant DA, told TheJournal.ie in a statement. The destructive testing was used “to determine the process in which the balconies were constructed” Dunleavy said. Observers representing the victims’ families have been allowed to observe the testing with a view to any future civil litigation that may take place. “The experts hope to determine the source of the water intrusion that left the balcony in such an unsafe condition,” said Dunleavy. J1 students Lorcán Miller, Niccolai Schuster, Eoghan Culligan, Eimear Walsh, and Olivia Burke lost their lives in the tragedy at a 21st birthday party in the apartment complex in June. The final Irish student injured in the disaster, Hannah Waters, returned to Ireland at the end of last month. 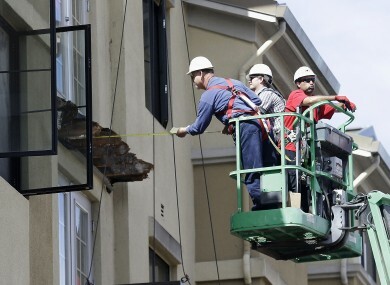 Email “Families attend Berkeley balcony testing as legal battles loom”. Feedback on “Families attend Berkeley balcony testing as legal battles loom”.